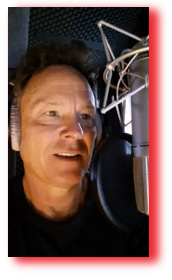 Steve Stansell is a Professional Voiceover Artist. He is currently the voice of HBO-Latin America! For More than 22 years, Steve has been “The Voice” for K & N Air Filters, The Miami Marlins, Target, Macy’s Training, Labcorp Inc, and dozens of audio books currently on sale at iTunes and Amazon! We encourage you to review a small sampling of Steve’s work. The key to a great Voiceover is that it gets you noticed; represents your brand powerfully; and conveys your message effectively. All of this can be achieved here. SS Voiceover is a full-service audio production and recording studio specializing in the professional voice talent you need for your project. Our experience is proven and vast. We’ve produced award-winning audio for all mediums including television, radio, corporations and agencies. A pure delight to listen to your narration! We have done nearly 100 audiobooks here at Mt. San Antonio College with over 75 narrators, And I must say I have enjoyed your voice and your reading the most!!! - Wonderful! I’ve had the pleasure of working with Steve since 2012. He has always been incredibly professional and attentive to our needs. In our fast paced industry, efficiency and quickness are key, and Steve has always been able to execute excellent voice over work. Hi Steve, I just wanted to say thanks again. I would really encourage you to go after other self-help books. Your voice is just right for it. I wish I had known about you when I got my first one done as you are a very talented narrator! Thank you for an incredible job! While you’re here, I invite you to Listen to my Audio and Video demos. Check out our state of the art Studio and what our satisfied, first-time and recurring clients have to say.